MAYA | 568 Julu Rd., Grand Plaza, Clubhouse 2nd Fl. 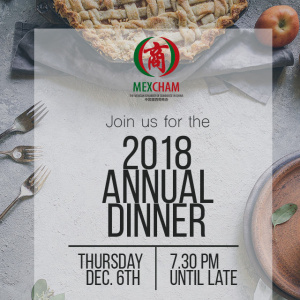 The MEXCHAM is glad to invite you to its 2018 Annual Dinner at MAYA restaurant to celebrate the end of an amazing year. This year has been full of opportunities, connections, business and partnerships made and we want to share this with all our members and friends of the Mexican Chamber of Commerce. The event will be held at the Mexican restaurant MAYA with a special dinner menu exclusively prepared for our guests. Also, there will be a raffle with prizes from some of our 2018 sponsors and partners and more surprises. Time: From 7.00 pm until late. Dinner will be served at 8pm. Location: MAYA restaurant | 568 Julu Rd., Grand Plaza, Clubhouse 2nd Fl. [IMPORTANT] Add on remarks your name so we can confirm that you have made they payment. FIELDS is a popular online grocer delivering safe, high quality produce and imported foods to your doorstep. Begun in 2009 with a focus on food safety, FIELDS offers a wide variety of organic vegetables, fruits and meats, as well as ready-to-serve items. Olmeca Tequila is a hand-crafted Tequila made with authentic, traditional methods at the heart of Los Altos, Mexico. Liverpool is the the largest department store in Mexico with 130+ locations in the country.